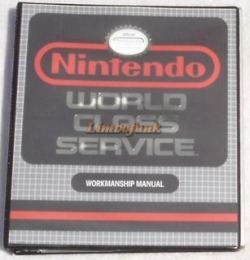 This manual gives in-depth explanations on all of the specifics required to discern weather or not Nintendo products were considered repairable or needed replacing. It shows detailed photographs ranging from the internals of the NES systems, games and accessories to how their outer cases were required to look in order to be reused. It is interesting to note that this is the only repair manual that has its pages placed in plastic sheet protectors. This was done so a technician could use the manual on-site to determine if the part would pass inspection to be reused. Since it was meant for use at the workbench, the pages were placed in sheets so they would not get dirty.